Phoenix Point is the spiritual successor to X-Com, this time developed under the leadership of the original team, including the inimitable Julian Gollop. It’s still a ways out, but that doesn’t mean it’s too early to put your money down, since the team are offering a discount for the duration of EGX this weekend. Check out our favorite PC strategy games. The “EGX20” code will knock 20% off the price of any preorder on the official site from now until Sunday. That discount could potentially be quite a bit, since Phoenix Point is offering some frankly ridiculous special editions, including a version that includes a day of hanging out with the developers. It’s the perfect chance to finally pick Julian’s brain on why your old campaigns always went sideways. Gollop sat down alongside modern XCOM designer Jake Solomon for a panel at EGX earlier today, where the two talked about the future of strategic alien defense. 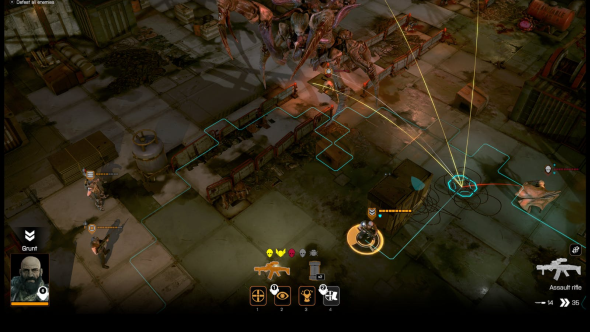 X-Com has moved from cult classic to major hit since the reboot, and revival Phoenix Point managed a successful crowdfunding campaign through Fig earlier this year. We’re currently expecting the game to launch in the latter part of 2018.